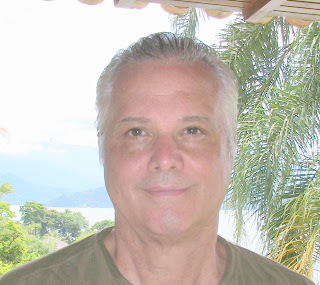 Leighton Gage is the author of the Chief Inspector Mario Silva Series, police procedurals set in Brazil. He loves to communicate with people, which may be one of the reasons why he is fluent in three languages and conversant in three more. He loves to travel, even to places that other folks may not find particularly appealing. He visited Spain in the time of Franco, Portugal in the time of Salazar, South Africa in the time of apartheid, Chile in the time of Pinochet, Argentina in the time of the junta, Prague, East Germany and Yugoslavia under the Communist yoke and lived in Brazil during the time of the military government. He and his Brazilian-born wife spend much of the year in a small town near São Paulo and the remainder visiting children and grandchildren who live in three other countries. Ernest Hemingway rewrote the first chapter of For Whom the Bell Tolls twenty-two times. When asked, How come? The Master said, Because I couldn’t get the words right. I cannot think of a better way to put it. It takes me a year to write each of my books. I work from outlines. I know how a book is going to end before I sit down to write it. I generally have the first draft on paper within six months of developing the overall concept. The rest of the time I spend on getting the words right. A friend of mine, a woman whose writing rhythm is much like my own, told me of a signing she’d done with another author. He said to her, I write three books a year. Do you think your books are three times better than mine? Flabbergasted (great word, that. How often do you get to use a word like flabbergasted?) she was unable to give Mr. Fecundity the kind of answer he deserved. A sweet and simple Yes would have sufficed. It would have been true as well. Each of her books is three times better than anything that gentleman (gentleman?) has ever written. He’s able to grind out his three books a year because he doesn’t re-write any of them. There was a cartoon, years ago, in The New Yorker. It showed a diminutive French sculptor. (You know he’s French because he’s got a little moustache and is wearing a beret.) He’s up on a high ladder with a mallet in one hand and a chisel in the other. His wife, hands on hips, is standing in the doorway of his studio. The huge statue he’d been working on has just split down the middle. Her line: There you go again, Pierre. You and your ‘one more tap’. I identify 100% with that gentleman. I don’t have a beret or a moustache, but that’s me. With every book, I keep on tapping until my publisher tells me the galleys are set in stone. I think all of us should do likewise. We owe it to our readers. A few years ago a gentleman I knew wrote a novel. His first and only. He developed a great premise, wrote it in a furious one-off, and submitted it to agents. And received the usual rejections. 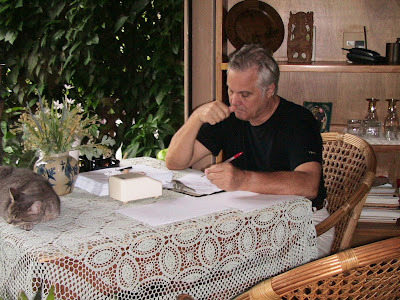 Impatient, he self-published – and, only then, did he ask me to critique it. I owed this guy. So I did it. I read his work, made copious notes and composed myself for a long session with him. Fifteen minutes in, he started to balk. I told him what I tell anyone who considers embracing this profession: If you’re not prepared to write your book all over again, don’t waste your time writing it in the first place. He wasn’t so prepared. He gave up. Here’s a photo of me at work. See that stack of paper? That’s a clue, that I’m revising, maybe for the fifth or sixth time. 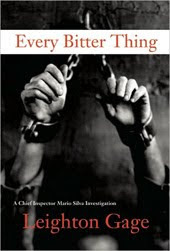 I don’t remember which draft it was, but I do remember the book I was working on: Every Bitter Thing, the fourth in the Chief Inspector Mario Silva series. Like all the others, it took months to get the words right. Our shopping lists, my grandchildren’s drawings, my daily notes, messages that my wife and I leave for each other – all are on the back of marked-up manuscript pages. The mother lode of the entire neighborhood’s supply of scrap paper is located in my office. Every book yields a stack half as tall as the working surface of my writing desk. I bought a laser printer because I got tired of waiting for manuscripts to print-out on my aged inkjet. I have never seen a single page of my prose that I didn’t think I could improve upon by re-writing. Including what I’m writing now. I’ll put it aside for a few days when I’ve finished banging it out. And then I’ll tap, tap, tap. And tap again before I send it off to Kaye. And, since you, Dear Reader, are unlikely to honor me by putting it on a shelf in your home, or paying to acquire it, I figure I can take some liberties with it. By not revising this post anywhere near as much as I would a book. Knowing me, that means I’m going to blush when I see it up on Meanderings and Muses. Should I have begun three phrases in succession with the word And? Should I have kicked-off the post with the description of the cartoon instead of the quote from Hemingway? There’s always a good deal to consider, even in a short post like this one. It’s not only the secret of good writing. It’s the soul of writing well. Absolutely! The work begins in the revision stage. I knew there was a reason I'm not a writer (reader - yes, librarian - yes, book pusher - yes! But not a writer). I don't have that kind of dedication nor that kind of patience. think about you putting your whole being into your writing. I agree with Patty. You have dedication and patience. I hated rough drafts in school. Thank you for telling me about this blogsite. What a great list of authors. Like Patty, I am not a writer. I am definitely a reader and a book pusher of sorts. Like Patty, I don't have the dedication nor the patience. And...I don't have the talent. I have read your books (twice)and I appreciate the craftsmanship. But it is the talent, the creativity, that you have that gets the words on the paper the first time. No, I think beginning with the quote was right. Great post! Mr. Gage, thank you for this great piece of advice. I've known for a while that rewriting is a crucial part of the writing process, but it's good to be reminded. I can definitely relate to the whole re-reading/re-writing-what-I-write-to-death issue, and often find myself hesitating before making a simple Facebook post. "Did I say that right? Was that really what I was trying to express?" And the merciless blush when I spot a typo or notice a mistake of any sorts. "How could I have missed this?" I'm sure you know what I mean. You had me laughing with the beret-and-moustache-sporting Frenchman. I personally have never met a French person who wore berets. In fact, the last person I saw wearing a beret was Norwegian, and she did not have a moustache. I must admit, however, that I have, on occasions, seen Frenchmen sport a moustache. Norwegians, too. And Canadians, for that matter. And now, I'm going to post this and hope that I haven't missed anything. Lookie here: I, too, have begun three of my sentences with "and". Excellent post. I'm beginning Draft 3. I still have a long road to travel. I SAW that cartoon! And I heartily agree~when I met PD James a few years ago, she said "The real writing gets done in revision." For me, the hardest part of writing a novel is knowing when to stop. It is never finished. Every time I read it, I can find something to do a little bit better. At some point I have to say I am done -- but in my mind it will never be a finished product. I am so far behind with dropping by to say thank you to Leighton and everyone else who stopped by! Blame it on the cold that won't quit. But thanks, everyone. Leighton? Great post and I'm honored to have you here.